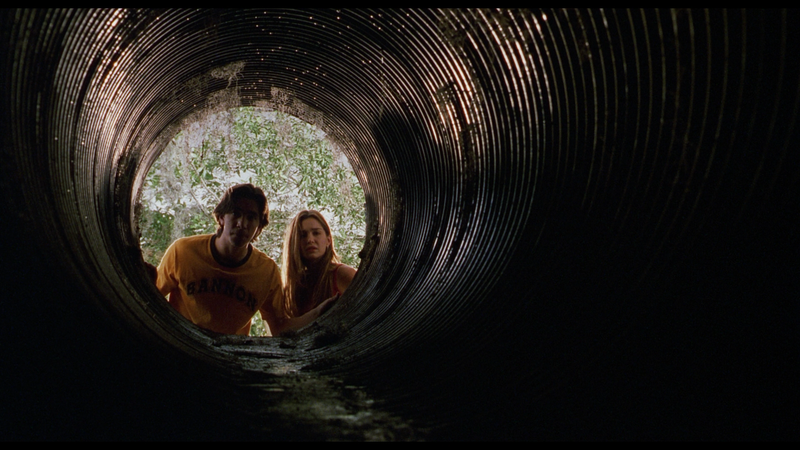 Plot Synopsis: On a desolate country highway two homeward-bound teens (GINA PHILIPS, JUSTIN LONG) are nearly run off the road by a maniac in a beat-up truck… and later spot him shoving what appears to be a body down a sewer pipe. But when they stop to investigate, they discover that the grisly reality at the bottom of that pipe is far worse than they could have every suspected… and that they are now the targets of an evil far more unspeakable – and unstoppable – than they could have ever imagined. 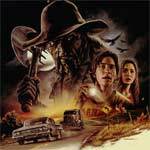 Quick Hit Review: Jeepers Creepers is the tale of two halves. The first is one hell of a great, and atmospheric, horror movie. The second, generic and frankly, a bit on the dull side where one counts down the time until it was finally over. What ties it together is with lead actors Gina Philips and Justin Long, who at that point marked only his third feature film but exude the right amount of charisma to play a character who is not the brightest bulb. And Philips for her part holds her own as a lead heroine though her career never quite took off (and she seems to be out of show business). Written and directed by Victor Salva made a moody and generally well made fantasy horror film that, although uneven, holds up fairly well since its release some 15 years ago. Even though The Creeper is generic and can’t hold a candle to the classics like Jason Voorhees or Michael Meyers, he’s still scary enough to make for a fun villain. This “Collector’s Edition” release comes with a matted slip cover. Audio Commentaries – There are two tracks included, the first is a new commentary with Writer/Director Victor Salva & Actors Justin Long and Gina Philips and the other is an old track with Salva. Both of them offer different types of info with the new one being better in just the flow where the trio recollect their time working on the film. 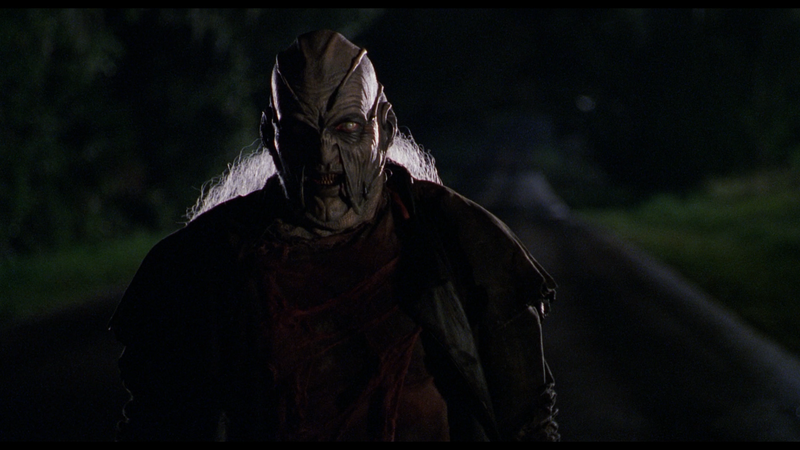 Jeepers Creepers: Now and Then (36:45; HD) is a well made retrospective featuring new interviews with Writer/Director Victor Salva, Producer Barry Opper, Director of Photographer Don FauntLeRoy, Editor Ed Marx and Actor Tom Tarantini (Roach). From Critters to Creepers (19:38; HD) – This is a profile on Producer Barry Opper on his career and work on Jeepers Creepers. The Town Psychic (16:34; HD) is a new interview with veteran actress Patricia Belcher (as seen on “Bones”) and numerous commercials as she discusses her character. 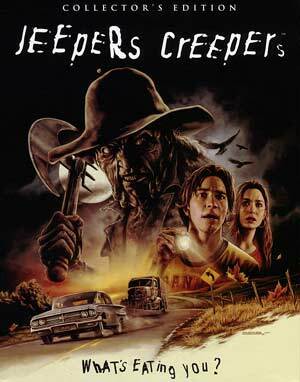 The Making of Jeepers Creepers (TRT 1:00:22; SD) contains six old featurettes: Finding Trish and Darry (11:11) on the casting of the two leads; Designing the Creeper (6:52) looking at how the villain was created; Cars and Trucks (11:41) on the vehicles used, specifically the lead car and the Creeper’s truck; The Creeper Comes to Florida (7:33) looks at actor Jonathan Breck who played The Creeper; Night Shoots (10:08) is on filming at night for the better part of a month; and Making the Score (12:57) chronicles the work done by composer Bennett Salvay. Under More Creepers we get some Deleted Scenes (17:13; SD), a Photo Gallery (7:56; HD), the Theatrical Trailer (1:54; HD) and a Radio Spot (1:00; HD). Shout Factory, via their Scream line, releases Jeepers Creepers onto Blu-ray presented in its original 1.85 widescreen aspect ratio and given a 1080p high-definition transfer. While there is some minor bouts of dust marks and dirt specs in places, it’s not an altogether bad looking transfer where colors are bright and detail fairly sharp. Considering this was a low budget horror movie from 2001, I was relatively impressed. The movie comes with both a 2.0 and 5.1 DTS-HD Master Audio track with the latter selected by default and for which I watched the movie with. The soundtrack is fairly remarkable for the clear dialogue levels while the soundtrack, and more to the point score by Bennett Salvay (“Full House” of all things), gives the most depth, however the LFE channel didn’t kick in very much. I didn’t note any major issues with hisses or pops so it’s a solid track. Overall, Jeepers Creepers works as a decent creature feature, albeit an uneven one with a great first half (solid 4/5) but devolves in the second half to standard fare. That said, Victor Salva’s film offers some good scares, nice performances by Justin Long and Gina Philips who work well opposite one another and some respectable make-up work. This “Collector’s Edition” Blu-ray release offers good video/audio transfers and a adequate amount of extras for fans or peruse.